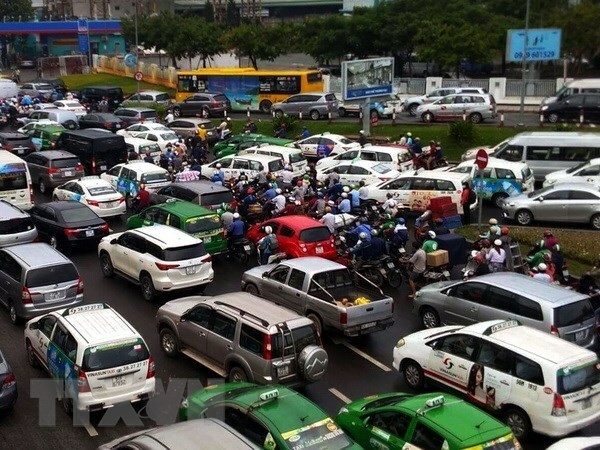 HCM City (VNS/VNA) - The HCM City People’s Committee has urged completion of key road projects near the Tan Son Nhat International Airport in the city to alleviate traffic congestion. The expansion project for Hoang Hoa Tham street, with investment capital of 255 billion VND (10.8 million USD), is still waiting for land to start construction, according to the city’s Department of Transport. The People’s Committee of Tan Binh district, where the airport is located, said the value of land owned by the Ministry of Defense near the airport must be assessed first before the land is reclaimed. Similarly, the project to upgrade the 134-metre-long and 14-19 metre-wide Cong Hoa street, with total capital of 142 billion VND (6.12 million USD), is also waiting for site clearance. If Tan Binh district hands over the land in the third quarter, the project will begin in the second quarter of 2020, according to the transport department. Other ongoing projects, including Truong Chinh street and Tan Ky Tan Quy street expansion, are still waiting for capital to implement other phases of the projects. Tran Vinh Tuyen, Vice Chairman of the city People’s Committee, said that expansion of roads around the airport and the airport’s connecting roads need to be done concurrently. The ministry has asked the Civil Aviation Authority of Vietnam to work with agencies and localities to implement the plan. The Tan San Nhat International Airport, the country’s busiest airport, has become seriously overloaded both on the ground and in the air, forcing many flights to wait in the air to land.